OUR STAR OF THE WEEK!! This week it is Charlie - Chicken Congratulations!! We have really enjoyed the first three days together, finding out about each other's holidays and thinking about what will make us happy as a class - the children had lots of good ideas! There will be an opportunity to see the children's classroom, find out about their learning and ask any questions on Thursday 13th September at 2:40, so please come along. In the meantime, please ensure that your child is reading and practising times tables every evening. Each child will also choose five spellings on a Friday to learn over the weekend. Please bring your completed spellings back in their orange book by the following Wednesday at the latest. In PE this term, the children will be learning gymnastics and multi skills and must bring their complete PE kit every Tuesday and Friday. Should you have any concerns or wish to talk to me about your child's progress, please feel free to speak to me . I will be in the playground at the end of the day. Year 3 will taking part in pedestrian training for 5 weeks starting this Thursday (13th). The training is important as it teaches the children to cross the road safely with an adult whilst developing their awareness and observation skills of the traffic. Please hand the permission slip to the office . Please scroll down to find out what we have been doing. This week in Maths we mentally calculated up to 999 (the police!). We learned about the redistributing strategy which means that we look to make friendly numbers, like multiples of ten and one hundred to make the calculation easier. We think this is a good method as it allows us to add and subtract large numbers in our heads! In English we have continued writing about our rainforest animal. We have started our posters, which look great. We will write the final two sections next week and then bring them home so you can find out all about them. We have been very busy this week making all sorts of things for the holiday. Look out next week for all our lovely crafts coming home! On Thursday we had our dress rehearsal, which was fantastic. We know that you will enjoy the performance on Monday. We also got to watch KS1 and though that there's was great too! On Tuesday we had our PomPOM treat and even though we weren't able to make Christmas biscuits, we still had some to munch on while we watched our film . Thank you Martha for bringing it in! We will have a Christmas party on Wednesday afternoon-19th December. The children are welcome to bring in snacks a to share, please remember no nuts! There will be no spelling homework sent out over the holidays. This break can be really busy for everyone, so let's just enjoy it! It has been a really busy week in Year 3 and I would like to say a big THANK YOU to all of the children for working so hard, listening carefully and just being fantastic! We have learnt a new word in Maths this week, equation. We realised that we already knew what that was, we had just called it by a different name. We looked at new methods for addition and subtraction that will help us do the calculation in our heads. We went and shared our stories with Year 2. We read the blurb, showed then the character pages and then read the stories to lots of children. Year 2 really enjoyed listening and looking at our fantastic pictures and we really enjoyed having audience for our amazing books! We have also learned a new word in English, determiner. We now know that these words introduce a noun. We played a game where some of us were nouns and some of us were the indefinite article. We had to find our partner and make up a sentence. Cherry was really impressed with how quickly we could do it and how great our sentences were. Please ask us about the definite and indefinite article - we think you'll be impressed too! This week our school choir went and sang at The Brighton Centre with lots of other schools from around Brighton. They worked really hard to learn all of the songs and actions and it was a brilliant night. Congratulations to them all, including Martha, Grace and Tum Tum from Year 3 and Elise who was sadly too poorly to go on the night. We have filled our PomPOM jar again and so will have a treat on Tuesday next week! We are making Christmas biscuits in the morning and then eating them with a Christmas film in the afternoon. Soft toys, Christmas hats and aprons are welcome too! On Monday we realised that our Science experiment hadn't worked in the way that we thought it might, so we have decided to change it slightly. We noticed that the celery leaves had changed colour very slightly and we could see that the water had travelled up the stem, but it wasn't as clear as we had hoped. We have begun to set it up again and will use carnations this time, so hopefully we'll have some clearer results. Please can the spellings be in by Wednesday so that we have a chance to look at them before Friday. There is an activity sheet in the front or the back of the spelling books and the children should complete three activities for each word! A couple of weeks ago some children from Year 3 went down to Brighton seafront to take part in a beach clean organised by Bea and her mum after school. There are some lovely pictures below of the children taking part in the Fish Club and they will be having another go in the new year. It was another exciting week in Science. We took apart sticks of celery to see how water was transported. We have made an experiment with some different sticks of celery, some food colouring and some water. We are going to wait until after the weekend to see what happens. Already, the sticks of celery seem to have shrunk and the bottom has turned different colours. Also there are some tiny holes in the bottom of the sticks and they seem to have turned a different colour too. We are excited for Monday morning! Most of us have finished our books about our boat trips. All of us were Writers of the Week, as Cherry couldn't believe how fantastic they all were. Most of our books have a blurb and we have added a character page at the beginning, just like Quentin Blake has in the books he illustrates for Roald Dhal. We have 'Raised our Swords' this week in our dance for the Christmas performance. We have worked really hard with our partners to get it just right and we hope everyone enjoys it when they watch the performance at the end of term. In Maths this week we had to show our working to subtract numbers bridging 100. Some of us found it a bit tricky so we will have another look at it next week too. We have become bug fixers in Scratch this week, by looking at a times table program. All of us could spot the problem and could correct it. We also has a go at making it do something different! In Geography, we had another look at our rainforest animals that we designed. We are going to make information posters about them so that people can discover what they eat and which layer of the rainforest to find them in. These are our spellings for this week - please bring them in by Wednesday next week! In English we are publishing our stories that we wrote last week, based on The Green Ship. We have made a front cover and some drawings of our stories. Some of us are already writing them neatly. They will be finished next week and we cannot wait to share them! We had a great time in Science this week. We have been learning about plants and had the chance to cut open a flower to look at all the parts. We learned that there is a female part and a male part. It was easy to see the inside of the tulip once we had carefully removed all of the petals. After we had cut them open and looked at everything carefully, we rubbed the pollen on a white piece paper to see how powdery it was. We then drew a diagram to show all the different parts. It has been another busy week in Maths. We are learning to use what we already know about the number 100, to add and subtract larger numbers. We have used base 10 and tens frames to help us. We should be able to show you if ask us! PE was great fun this week as we have started to learn a dance for the Christmas show. We had to listen really carefully to the music to make sure we came up with steps that fitted the rhythm. Martha and Eleanor were great at sharing their ideas with the class. It looks really impressive already! We had a great time in Geography this week too. We are still working on rainforests and this week created our own animal to live there. We had to think carefully about which layer they would live in and why. We will finish these next week, so watch this space for an exciting new rainforest creature. There was a change this week and we had our library time on a Thursday. We really enjoy being able to share books with each other and take them home to read. We have three fantastic librarians in our class who help us find books and check them out for us! It might be a good idea to practise the homophones, there and their, in a sentence. Most of us are already good at spelling them, we just need a bit more practise at using the right one in the right place. After school on Thursday, a group of Year 3 children went down to the beach for a beach clean to help protect the fish of our seas and oceans. difference to our local beaches and sea. Below are some of the children who are involved. In English this week we have been writing our own stories. We have written a little bit each day, starting with the opening, then the build up, followed the climax and on Monday we will write the resolution, if we haven't already! Next week we will publish these and put pictures with them. We have started a new book in Guided Reading and we are reading it all together as a class at the same time! It is another Roald Dahl book and is called The Twits. We are enjoying this new way of reading the book together and it's been really great to hear the different voices that the we have given the characters. We have worked so hard in Maths this week finding complements to 100. We know that we must count the ones first to make 10. Then we must make 90 from the rest of the tens. It has been tricky but we have cracked it today and will practise again next week. Maybe ask us about it and we try and explain it to you. On Monday we went to see the movie The BFG at Fabrica. We really enjoyed it, even though some of us had seen it before. Watching a film in Fabrica was really exciting because not many of us had been in there before. We have been looking at where the rainforests are in the world and have learned a really funny song to help us remember the different types of animals that live there...RAINFORESTS! Please bring them in before Wednesday - thank you! 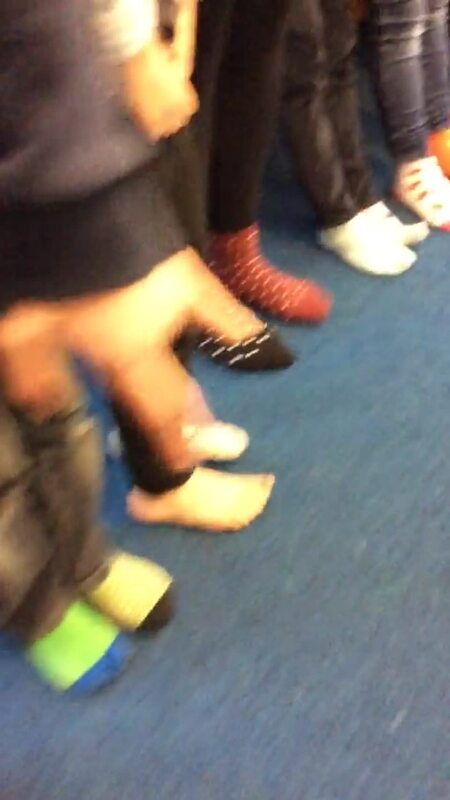 This week we have all worn odd socks for Anti-Bullying week- one of us even wore odd earrings! We have made posters and thought really hard about being respectful and kind to each other. We have thought about what makes a good friend. Look down below for our posters and a video of our socks! Welcome back everyone from a half term break. We had lots of exciting adventures to talk about in our check in, including trips to Poland, France, St Ives and Ireland, visits to The Imperial War Museum and even a flood in a restaurant in Venice! We have started to look at adding and subtracting mentally in Maths. We have learned how to dual count and have used the bar method to help us with our calculations. Please ask us to show you as we are very good at both of these. In English this week we finished our book The Green Ship. We wrote book reviews and Noah won writer of the week for his. We also made our own green ships in the hall out of all sorts of PE equipment. When we were sure they were watertight, we climbed aboard and had an adventure. Have a look at the pictures below. It was really good fun and we are looking forward to writing our own stories about our adventure. We have been outside in Science this week looking at the different habitats. We enjoyed seeing the woodlice under the Astroturf and watching the snails sitting on the benches. We thought about how the pigeons and seagulls like to visit our playground and realised it was probably due to our playtime snacks being so tasty! We will keep an eye on the different habitats we found and see how they change throughout the year. In PE this week, we made sequences with our groups using the apparatus. It was quite tricky to create one using the big wall apparatus, but Cai, Kascper, Athos and Cosmo thought really carefully and managed it. Tum Tum, Amber, Miri and Elsie used the benches really effectively and were all involved in making their sequence a success - great collaboration! Please try and get them in on Wednesday. We are off to Fabrica on Monday to see The BFG on the big screen. We are all looking forward to this, especially as it's not very far to walk! We have a new member of our class - welcome Kevin! Lots of us have participated in Walk to School Week this week which has been great. People have walked, scooted, cycled and tried to change their journey so that even if they drive to school, they have parked a bit further away and walked the last bit. Lots of us enjoyed the Wake and Shake dances in the mornings - Martha and Noah were regulars, getting themselves ready for the day. We also met Piers the Meerkat on Monday, who caused much excitement when he joined our check in. We have written about our Science topic this week using information from the internet and non-fiction books. We have made pages with pop-up trees that have lots of information about plants and made posters about the different classes of animals. We have learned a lot about how living things are classified. Have a look below at our pop-up pages, they are brilliant...even if we say so ourselves! This week we were lucky enough to have our PomPOM jar treat. We watched a film, had hot chocolate, ate popcorn and wore our pjs. It was really good fun. We have already half filled our jar so we must be working really hard. On Thursday we had our Cabaret Assembly. We had lots of fantastic auditions and the voting was very close. The two acts that got to perform for Year 3 were Katerina and Grace dancing to Firework and Martha tap dancing. Well done to everyone who auditioned and performed - the audience were fantastic too - very supportive of their classmates! We have almost finished our Scratch animations, which look great. We had a team of Year 6 experts swoop in and support us in making sure the animations could do what we wanted them to do. It was great to work with them, they were very patient and shared their skills with us, making sure we understood - thank you! On Friday we celebrated Diwali by having henna on our hands, pittas and dip as well as learning about the Festival of Lights. We learned about the story of Rama and Sita and had lots of fun with our friends making lanterns. It was a great way to finish off the first term of hard work! We are really pleased to welcome a new member to our class - we hope you enjoy Year 3! The children are not bringing any spellings home this week -they can have a well deserved rest over half term! If they feel in the mood for some learning, they can practise their times tables and check back to see if they remember how to spell the words from previous weeks. Have a great half term and see you on Monday 5th November. It is parents evening on Monday and Tuesday next week from 3.30. Please check the classroom door if you haven't received your appointment time - all slips have been given to the children but I understand that sometimes they do not make it from the classroom to the playground and then home. All appointments are listed on the Year 3 door and I'm really looking forward to catching up with everyone. This week we learned how to be programmers in ICT. We created a character, known as a sprite on Scratch and decided on our background. Some of us have managed to make it move already. Cosmo, Charlie and Cai are looking forward to making their sprites move next week! Below is a photo of Tom and Ava's, they had lots of fun working out how to make their sprites move. At one point they were upside down! We read the next part of The Green Ship and got to the storm. The characters from the book felt like they were at sea, even though they were just pretending. Cherry showed us a video of what it might feel like to be at sea in a storm. She made some of us feel seasick! We made pictures of the ship in the storm using charcoal - they are amazing, have a look below. This week in Science we started learning about plants and animal habitats. We went outside and had a look at all the different plants that are growing around our school. We have started to make pop up trees to go in our Science books and next week our English writing will be about trees. We finished our pedestrian training on Thursday and all passed! We are Stage 2 trained and know where to find a safe place to cross, what hazards to look out for and how to keep ourselves safe as pedestrians. Everyone received a certificate and a badge to show what we had achieved. In Maths, we have learned how to order numbers from smallest to largest and largest to smallest. We have been counting in 50s. We are good at this because it is similar to counting in 5s. Please ask us about the numbers 45 and 450. We should be able to tell you what is the same and what is different about them. We are still learning new movements in gymnastics. We added these to our routines and next week we can try them out on the apparatus. The movements were, tuck, the arch, the straddle and the pike. We have been really sensible in PE, understanding we need to be quiet to keep ourselves safe on the equipment. Please try to practise all of them before Wednesday next week! The big new this week is that we have filled our PomPOM jar and so will have our treat next Tuesday. We have chosen to have a film, popcorn and hot chocolate. We can wear pjs and dressing gowns if we want to! We have FINALLY started our Science topic. We made posters about what makes a living thing. Have look below to see our fantastic work! We had pieces of paper which had the information about living things and then we wrote about them under special headings. We decorated our posters with animals and plants. We have a new English book called The Green Ship. We read the first few pages and then made a picture of what we thought was behind the trees. There is a character in it called Mrs Tredegar and some of us thought she looked a bit suspicious. In the book we have seen a picture of ship made out of trees and leaves and now we are wondering where it will take us. We pretended we were the girl and boy from the book and we thought about how they felt when they found the ship. Martha's face was so surprised! We had the apparatus out again in PE and we are so careful with our movements, thinking about how we can make ourselves wide and thin as well as tiny and tall. Rocco and Martha were PE Stars of the Week because they were really good at working as a team and helping each other. We are still learning how to put an arch, a straddle and all of our other movements into a routine. In Maths we have looked at a strange video in Gonoodle, to help us remember greater than, less than and equals too. Have a look at home and do the dance...hollabaloo! We have been able to add to our classroom displays with all of our lovely work. You'll be able to see it at parents evening on Monday 15th October and Tuesday 16th October. Confirmation slips of the date and time slot allocated are being sent home with the children so please check bags! In English, we pretended that we were the boy and we wrote a diary to make sure we remembered all of the exciting things that had happened in the book. We had to write in chronological order and make sure that our writing was in the past tense. We also learned about subordinating and coordinating conjunctions. Please ask us what these are! In Geography we made maps of where the boy went, who he met and what he saw. We really had to think about the route he had taken and what he had seen to make sure we could guide him safely through the forest. We looked at finding 1, 10 and 100 more or less of lots of different numbers. We learned what the mathematical alphabet was and the difference between a digit and a number. The apparatus came out in gymnastics and we carefully made routines to put together movements we have looked at for the past two weeks. Noah shared with us a great routine using the benches and some of his martial arts movements - very impressive! This week we emailed Dad from the story and luckily, we now know where he is and how the story ends. It was a great ending! We wrote about the story in less than 50 words, but it was so hard that most of us wrote a bit more! We all really enjoyed making a story map. Have a look below at some of them. We had our first Geography lesson this week too. We made treasure maps using a grid and found lots of Brighton landmarks using grids too. It was really tricky to find the Victoria Statue, but we manged it using the grids. Next week we are going to make a map for the boy in our English book so that he can find his way out of the forest. In Maths, we are still learning about 100s, 10s and 1s. We are working really hard to solve reasoning problems with a place value chart. Please ask us how to use one. We really enjoyed our gymnastic session this week and used some new moves to make a routine. We learnt about the arch, the dish, the pike, the straddle and the tuck, which made our muscles in our stomach work really hard! Year 3 have a new member - Welcome Katerina!! This week we have found out that our new English book is called Into The Forest. We could only see the front cover and we had to make suggestions about what would happen. Some of us thought the boy might find his Grandma in the forest or maybe a Velociraptor! Now we have read some of the pages were are wondering where the boy's dad has gone. Next week we will email Dad to find out. In Maths we have been learning about hundreds, tens, ones and we are pretty good at it! Next week we are looking forward to Have A Go Flamingo!! PE was fun this week, with lots of us practising our gymnastic skills. Kacper, Athos, Ivy, Maya,Tum Tum, Tom, Amber and Kelsey all shared their routines with the class. All of us have talked about what makes us feel 'Fizzy' and how we can make ourselves feel 'Just Right', please ask us! We went out for Pedestrian Training with a partner and grown up. We practised crossing the roads, looking right THEN left and keeping ourselves safe in traffic.